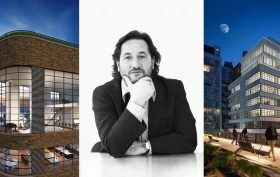 Cary Tamarkin is the founder and president of Tamarkin Co., an architecture and real estate development company established in 1994 and based in New York City. He worked as an architect exclusively for many years before deciding to go into development. As it turned out, he was able to combine his passion for both architecture and business by designing the buildings he develops. His notable projects include the renovation of Anderson Cooper’s Greenwich Village firehouse, 10 Sullivan Street, 456 West 19th Street, 508 West 24th Street, which is adjacent to the Highline, and 550 West 29th Street, also near the Highline. His designs use materials reminiscent of old New York, such as industrial steel windows, corbelled bricks, outdoor loggias, and oversized casement ribbon windows, however, he’s not interested in mimicking existing architecture. Nor is he looking to create a “self-contained statement.” Ahead he discusses his career path, his inspirations, and the meld of architecture and development that he balances today.